Listen up Paid Social Advertising practitioners, we’ve got another industry update for you and your clients! In an effort to maximize cost efficiency while driving volume for your clients’ primary KPIs, Facebook is introducing a new bidding strategy called Cost Cap Bidding to select advertisers throughout the year. Cost Cap simplifies campaign management and helps you focus on scaling volume of results while controlling costs. Unlike other bid strategies that help optimize for cost, such as Bid Cap or Target Cost, Cost Cap enables you to set the max CPA/CPI you’re willing to pay for results, reducing complexities in managing bids while maximizing your campaign results. 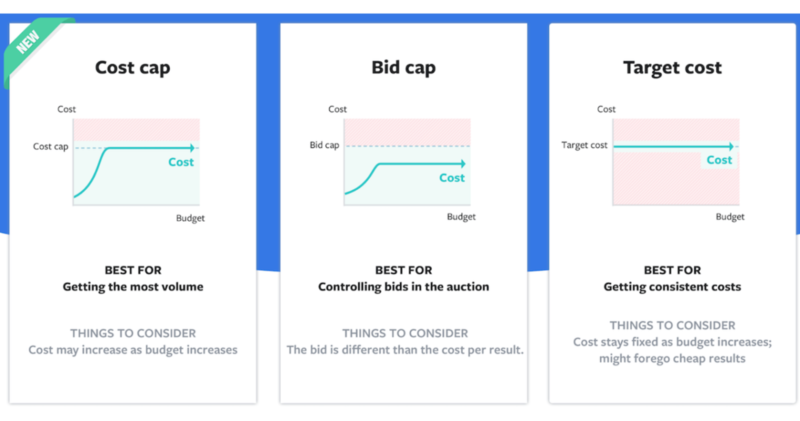 See below for a visual graph of the “cost control” bidding types on Facebook; Bid Cap, Target Cost, and the new Cost Cap bidding. At Seer, we are currently utilizing Lowest Cost bidding strategy across our clients, which allows us to get the most results for our budget. Seer is looking to testing this new feature in the future and hope you test with your clients too! Be sure to reach out when this becomes available for your account and share your experience.